Austria, which is currently holding the EU presidency, is “actively working” toward that goal, she asserted. 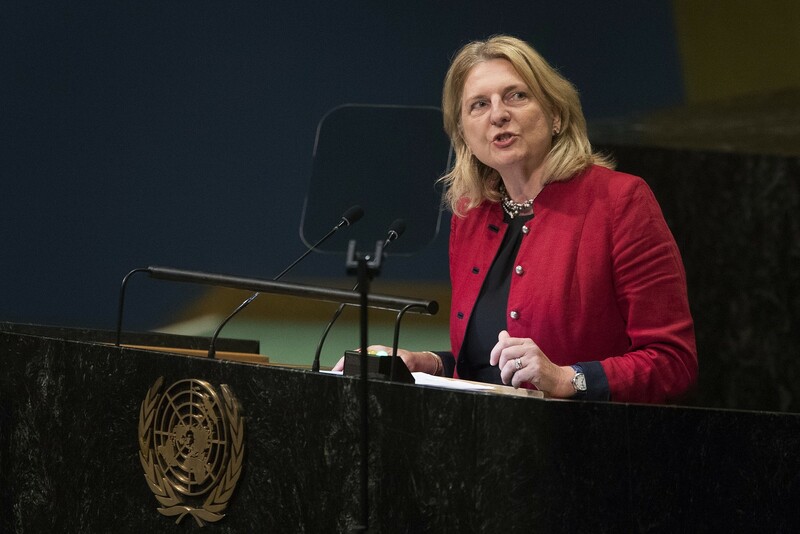 She also spoke about the need to confront both anti-Semitism and anti-Zionism and expressed satisfaction over proposed legislation that would grant descendants of Austrian Holocaust survivors Austrian citizenship. So far, Kneissl’s overture has not been reciprocated by the Israeli government, but that may change soon. 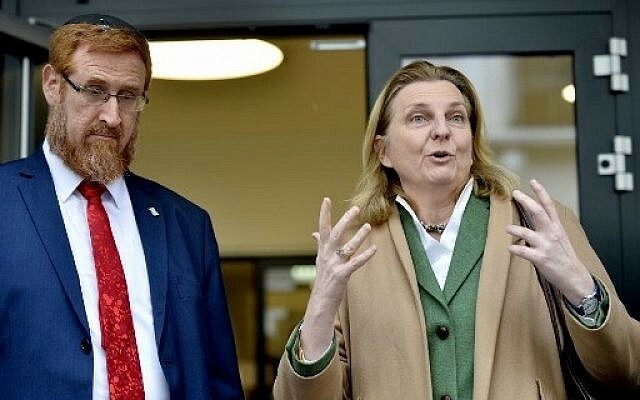 Since she was nominated for the foreign minister position by the Freedom Party, known by its German acronym FPOe, Israeli officials currently refuse any contacts with Kneissl (a lone lawmaker, Likud’s Yehuda Glick, openly embraces her, as he believes Israel should cooperate with the FPOe). 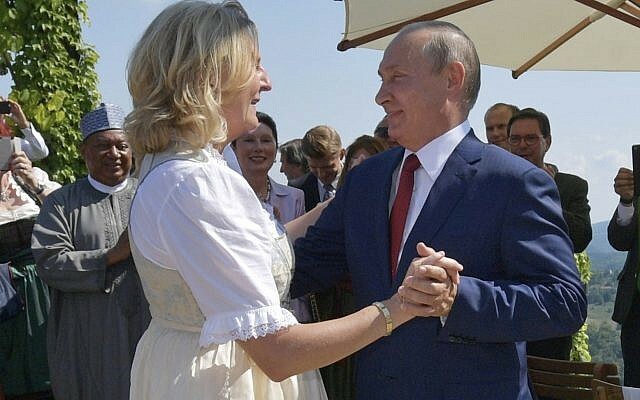 But the government of Chancellor Sebastian Kurz continues to urge Israel to lift the boycott, if not of the FPOe than at least of Kneissl, who is not formally a member of the party. Several officials in Vienna and Jerusalem have told The Times of Israel this week that, while Israel is not planning to engage with FPOe members, it may consider establishing contacts with Kneissl in the near future. 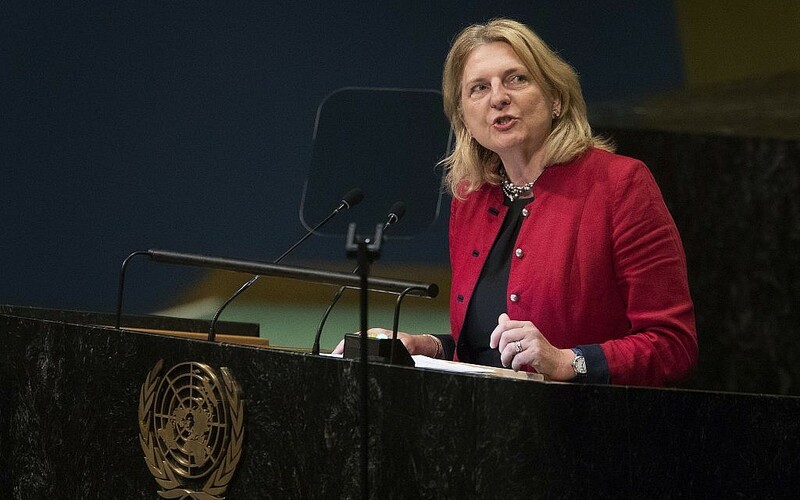 Kneissl, who wrote her doctoral thesis in international law about the concept of borders in the Middle East, declined to comment on this “hypothetical question,” but indicated that she was keen on interacting with Israeli diplomats. The Vienna-born foreign minister, who lived in Israel for two years, defended the FPOe against accusations of anti-Semitism and xenophobia by Israeli officials and Austria’s Jewish community. The government in Vienna — a coalition of FPOe and Kurz’s center-right People’s Party — has clearly stated its support for Israel and Austria’s Jewish community and vowed to fight anti-Semitism, she said. Later on Thursday, however, Netanyahu cancelled the visit due to the current political crisis in Israel. It would have been the first trip to Austria of an Israeli prime minister since 1997. Here is the full transcript of our interview, which took place before Netanyahu canceled the trip. The Times of Israel: Prime Minister Benjamin Netanyahu is planning to visit Vienna next week, where he will, among other things, attend a conference against anti-Semitism and anti-Zionism. Do you agree that anti-Zionism is a new form of anti-Semitism, and that these two terms can be equated? Karin Kneissl: Anti-Semitism is a broader phenomenon than anti-Zionism, not all anti-Semitism is also anti-Zionism. Prejudices against Jews and Jewish communities exist in many cases that have nothing to do with the State of Israel. Even Jews who do not consider themselves as Zionists can of course be victims of anti-Semitism. On the other hand, anti-Zionism often does have a strong anti-Semitic element. Needless to say, we need to oppose both anti-Semitism and anti-Zionism, which is why the conference explicitly addresses both of them. What do you expect from Netanyahu’s visit — the first of an Israeli prime minister in more than 20 years — in terms of bilateral relations? Prime Minister Netanyahu said a few months ago that the relations between our two countries are excellent — I couldn’t agree more. As you rightly say, a visit by an Israeli prime minister to Austria doesn’t happen just every day. This visit is therefore a strong confirmation of our profound bilateral bonds — Austria is very much looking forward to hosting the prime minister and his wife. Unfortunately, I will not be in Vienna during this visit since I have been asked several months ago by High Representative Federica Mogherini to chair as EU presidency a number of EU meetings in Brussels. The government you’re serving in has promised to offer Austrian citizenship to Jews whose ancestors were Austrian but had their nationality stripped by the Nazis. Where is that project standing? Where and when can people apply for Austrian citizenship? How many Israelis have expressed interest in receiving Austrian citizenship? I am very glad indeed that the descendants of Austrian Holocaust survivors — even in the second and third generation — will soon be able to receive Austrian citizenship while maintaining their current nationality. We are in the process of preparing a detailed legislative proposal for this, so it is a bit too early to say when this new law will be adopted by parliament. But we are speaking about months, not years. There will definitely be a few hundred Israelis who are interested in receiving the Austrian citizenship, maybe more. 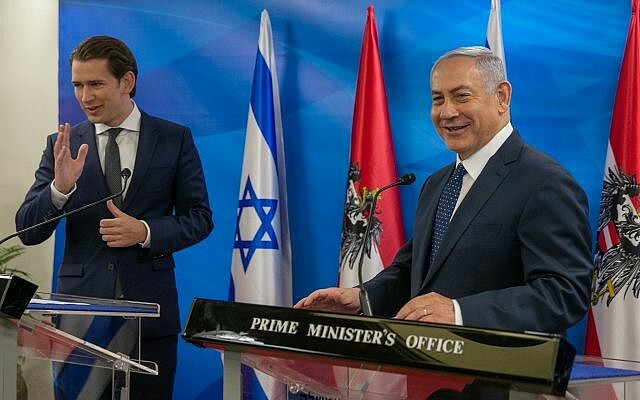 Netanyahu repeatedly complained about the EU being ‘hostile’ toward Israel, and during his last visit, Chancellor Kurz vowed to back Israel in its dealing with Brussels. Do you agree that Brussels often treats Israel unfairly? If so, why do you think that is? In what ways has Kurz’s promise of support for Israel in the EU materialized? I know that many Israelis feel that — while there exist strong bilateral ties with a number of European countries — the relationship with the EU on a whole never quite lives up to its full potential. And there is something to that. We have for example not seen a meeting of the EU-Israel Association Council in many years, although there are many important issues to discuss. I have the impression that Israel often gets measured by a particularly tall measuring stick – and I believe that the relationship between Israel and Europe could need an injection of some more realism. This is something that Austria is actively working for. Israel’s neighbors are not Switzerland and Liechtenstein, it would do Europe good to remember this sometimes. Netanyahu will, at least for the time being, continue to avoid meeting members of the FPOe, and officials considered close to the party, such as yourself. What do you make of the fact that, nearly a year after the Austrian government was formed, Israeli official are still not speaking to you? As I’ve said many times before, it is entirely up to Israel to decide who its representatives will meet with or not — and I fully respect this. That said, I hope that the visit by PM Netanyahu to Austria will be a good opportunity to get a first-hand impression of this government and its clear commitment to the security of Israel as well as to the fight against anti-Semitism. These commitments are unequivocally shared by both coalition partners and form an essential part of our government program. Next week’s anti-Semitism conference is but one small example of the many steps we are taking in that regard. It has been reported recently that high-ranking Austrian officials are pressuring the Israeli government to lift its boycott of the FPOe. Are you aware of this? I don’t much like the expression “fake news,” but not everything that is reported in the media necessarily corresponds to the truth. Of course Austria wants to enjoy the best possible relations with Israel, that is only natural. This would include a dialogue on all levels and include all Ministers of the Austrian government. To use the word “pressure” in this context, however, gives an entirely wrong impression — we want to convince, not to extort. Officials in Jerusalem and Vienna have indicated that Israel may lift its boycott of you, after Netanyahu’s visit, because you are not formally a member of the party. How do you feel about this apparent compromise? Is that an acceptable formula for you — the FPOe-affiliated foreign minister yes, the rest of the FPOe no? That is an entirely hypothetical question. But let me say this: the whole raison d’être of a foreign minister is to get together with his or her counterparts, to exchange views and to work directly and personally towards the strengthening of international relations. I have worked for this goal even before I accepted my nomination as foreign minister, and I will continue to do so in the coming years. 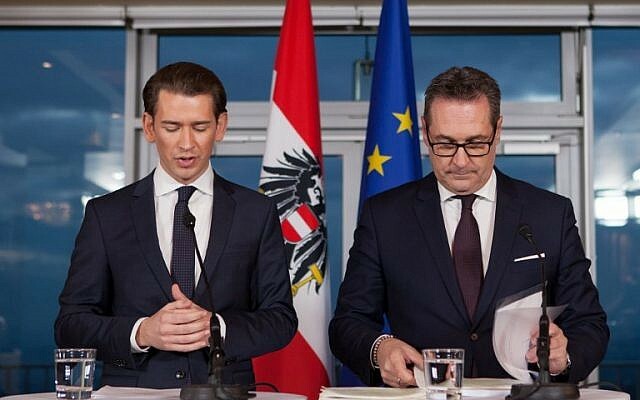 When the Austrian government took office in December 2017, both Chancellor Kurz and Vice-Chancellor Strache expressed the hope that with time the Austrian Jewish community and the State of Israel would change its attitude toward the FPOe. That hope did not materialize. How can you explain that? This government has been in office for less than a year, and I think we have achieved a lot in the past months. I am proud that according to recent polls, many Austrians — those who voted for one of the two parties in government but also many of those who didn’t — are supporting our policies. The government program is very clear regarding our support for the Jewish community and the State of Israel, our fight against anti-Semitism, and our efforts to find the right words when it comes to our own history. I am confident that over time, even those who still have their doubts will come to appreciate that these are not only empty words. 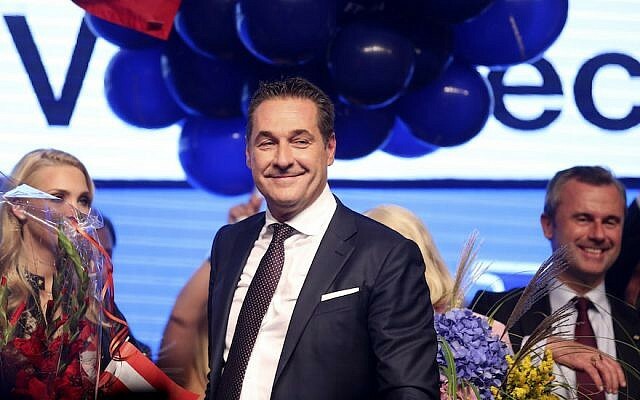 Austrian Jewish community leaders are as convinced as ever that the FPOe has not done enough, and is still not doing enough, to distance itself from its neo-Nazi past. They cite 41 “incidents” involving party members they say attest to either anti-Semitism or sympathy for neo-Nazi ideologies. In only two cases did the party become active, according to the Jewish community. Can you really say the party is doing enough in that respect? FPOe chief and Vice-Chancellor Heinz-Christian Strache has repeatedly emphasized that there is no space for anti-Semitism in his party. I am absolutely convinced that neither he nor any other member of this government is anti-Semitic or tolerates anti-Semitism. In fact, Mr. Strache takes a keen interest in Israel, its history and culture. You have been accused of comparing Zionism to Nazism. You have since denied making this comparison, but the claim continues to be cited occasionally by Israeli newspapers. Do you care to explain what exactly you meant when you described early Zionism as a “blood-and-soil ideology based on German nationalism” in your 2014 book ‘My Middle East’? To insinuate any comparison between Nazism and Zionism is utter nonsense. I have certainly never made any such comparison. My book was edited and widely reviewed and at no point did anybody utter such criticism. Also, I lived in Israel for two years, was one of the first Austrian students to study at the Hebrew University of Jerusalem, where I also gave lectures until recently. During this time too I have never heard any criticism of this sort. Regrettably, after I was appointed foreign minister some media took one line of my book and did not bother to explain the historical context. What I pointed out in my book is the historical fact that Theodor Herzl was certainly inspired by the nationalist aspirations that swept through many European countries during the 19th century. These movements were children of their time and thus resembled each other.